Product information "Hydrogen Peroxide Cell-Based Assay Kit"
Reactive oxygen species, such as hydrogen peroxide (H2O2) and superoxide are generated by phagocytes and participate in damaging invading miccroorganisms or other biologic targets. Cayman's H2O2 Cell-Based Assay Kit provides a simple fluorometric method for the sensitive quantitation of extracellular H2O2 produced by cultured cells. H2O2 is detected using ADHP (10-acetyl-3,7-dihydroxyphenoxazine), a highly sensitive and stable probe for H2O2. In the presence of horseradish peroxidase, ADHP reacts with H2O2 with a 1:1 stoichiometry to produce highly fluorescent resorufin. Resorufin fluorescence can be read using an excitation wavelength between 530-560 nm and an emission wavelength of 590 nm. Catalase, an H2O2 scavenger, is included in the kit for checking specificity of the assay. 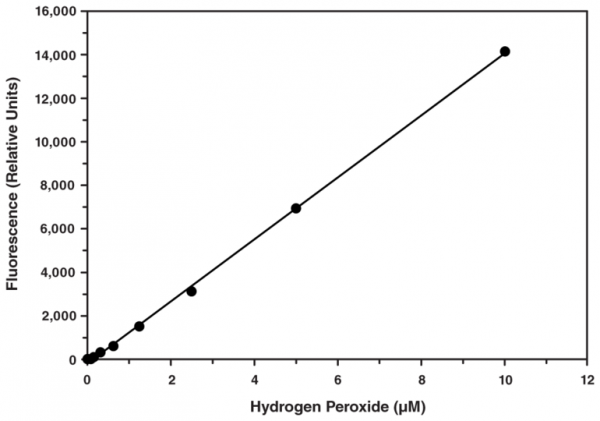 Customer review for "Hydrogen Peroxide Cell-Based Assay Kit"